A collaborative inbox built for all sources and all teams, allowing users to manage email and chat conversations from one central place. Chatbots to automate the delivery of information and facilitate more high-quality conversations, built on technology from HubSpot’s recent acquisition of top chatbot platform Motion AI. Targeting and lead routing working seamlessly with HubSpot CRM, allowing for sophisticated targeting and lead routing that connects the right people at the right time. 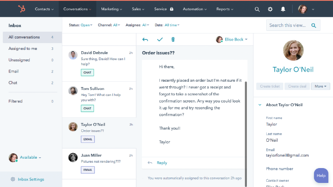 Conversations is a core feature of HubSpot CRM and is available across all of HubSpot’s product offerings – Marketing Hub, Sales Hub, and the recently released Service Hub. To learn more about Conversations, please visit http://www.hubspot.com/products/crm/conversations.